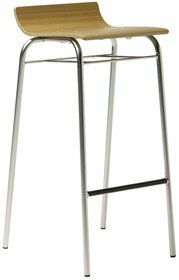 Tall sleek stool with a low back and integral foot rest. Choose from a huge variety of colours and veneer choices. Available for a free UK mainland delivery service as standard. Sleek design bar stool with a beech wood seat, slight curve shape for a modern look. Available complete with a black or silver frame.